Opera Mini landed in Apple's App Store earlier this week, and so far reviews have been mostly positive about the first non-Apple Web browser to make it to the iPhone. The new addition quickly became the top free download for the iPhone, and will no doubt spur other mobile browser makers to get their applications iPhone-ready. But, despite all the excitement surrounding Opera Mini on the iPhone, does this browser really improve the iPhone user experience? More importantly, will Apple eventually be forced to change how its operating system behaves in order to allow for more competition among browsers? By most early accounts, Opera Mini for iPhone is a faster browser than mobile Safari. But Opera also lacks some key features that Safari has, such as the ability to mail a Web page, create a home screen shortcut for a Web app, and the use of pinch-to-zoom. However, Opera has some of its own features that Safari could incorporate, too, including the ability to search for keywords in a Web page, a better approach to tabbed browsing, image quality settings, and Speed Dial. With such a mixed bag of advantages and disadvantages, early hands-on reviewers had a mixed, albeit mostly positive, reaction to Opera. Technologizer's Harry McCracken called Opera for iPhone a "slightly more feature-rich alternative to Safari," and Lifehacker said the new browser was "an ideal browser for a quick lookup." PC Magazine said that iPhone users in the U.S. may see more of a benefit from Opera than other places around the world because "when AT&T's network totally collapses on you, Opera Mini pulls Web pages out where Apple's own browser stalls and gutters." Now that Opera is available on the iPhone, which mobile browser will be next to hit the iTunes App Store? Mobile browser maker Skyfire says it will now accelerate its strategy for the iPhone and iPad, and perhaps Mozilla will rethink its decision not to bring Firefox Mobile to the iPhone. 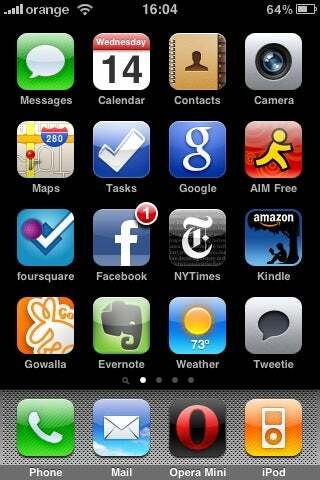 Does a Mobile browser for iPhone matter? It's always nice to have a choice when it comes to browsers, and the iPhone is no exception, but even with Opera Mini installed, you're not always given the choice to use it. Sure, you can do what I've done in this screenshot, and replace Opera Mini with Safari in your iPhone dock. But that does little more than change the look of the iPhone's home screen, and makes it easier to access Opera on the fly. The fact remains that the iPhone OS does not allow anything but mobile Safari to be used as your iPhone's default browser. So any time you want to open up a Web app from Google's mobile search application or click on a link in Tweetie or the iPhone's Mail app, Safari is the browser that acts as your portal to the Web. And, in my experience, most mobile Web browsing on the iPhone is a result of clicking on links in applications as opposed to entering URLs into the mobile Safari address bar. So does it really matter that much if you have Opera on your iPhone? And since Safari is so deeply integrated into the iPhone user experience, how long will it take before Opera for iPhone becomes just another forgotten app buried on the last page of your home screen? A wedge to open the iPhone? Then again, Web browsers have a way of being a wedge issue, one that can force a platform to become more open. Just take a look at what happened recently to Microsoft in Europe where the software giant was forced to stop bundling Internet Explorer with Windows after a complaint to the European Commission. As a matter of fact, it was Opera that challenged Microsoft's Web browser bundling practice in the first place. So who knows? Perhaps Opera will launch a similar complaint against Apple to allow for greater consumer choice and competition when it comes to changing your default browser in the iPhone OS.